The first time I heard the name Václav Havel I was in Insein prison, serving a sentence for my participation in the 1988 student uprisings. Daw Aung San Suu Kyi had just been nominated for the Nobel Peace Prize by this man from the Czech Republic who was little known in Burma. We were proud that the leader of our democracy movement received a prestigious international award, and hoped that it would raise awareness on the political situation in Burma. I wished to pay my respects to this Václav Havel for his support for human rights and democracy in Burma. I soon learned that he too, was a former political prisoner, who had courageously led the Velvet Revolution, a bloodless protest that swept Czechoslovakia and brought the Communist regime to its knees. Halfway through their march, the protesters were stopped by an army of policemen. The group, inspired and led by Havel, presented the police with flowers and showed their bare hands while singing songs. This incident, more than any other, shows the strength of Havel’s high moral character that shaped him as a fountainhead of inspiration for all who struggle for freedom. There is a pact that bonds all current and former political prisoners in Burma: we will not rest until all political prisoners are freed. This pact holds true all over the world, for one political prisoner anywhere is one political prisoner too many. Although I was still in prison, I felt an instant rapport with Václav Havel, for he too, sacrificed his life for truth and justice, just like so many in Burma have for countless years. Havel’s unwavering commitment to democracy nourished all of us who were in prison dreaming of a free Burma, supplying us with much-needed hope that we, too, shall overcome the twin evils of oppression and injustice. It became my dream to meet him, this incredibly courageous man who went from prison to the presidency, bringing freedom to a nation that had been systematically denied human rights for over 50 years. I never thought that one day my dream would come true. In 2001, the Czech-based human rights group People in Need awarded Min Ko Naing the Homo Homini award for his leading role in the mass demonstrations in 1988. As Min Ko Naing was still in prison, serving a 20 year sentence, I was selected to receive his award. I was finally able to meet the man who inspired me from the dark walls of my prison cell. We spoke about the situation in Burma and the state of political prisoners; above all, Havel was charming and well-versed in Burma issues. It would be the first of several meetings between us and the beginning of a friendship. Václav Havel ceaselessly campaigned for the release of political prisoners in Burma throughout his entire career. 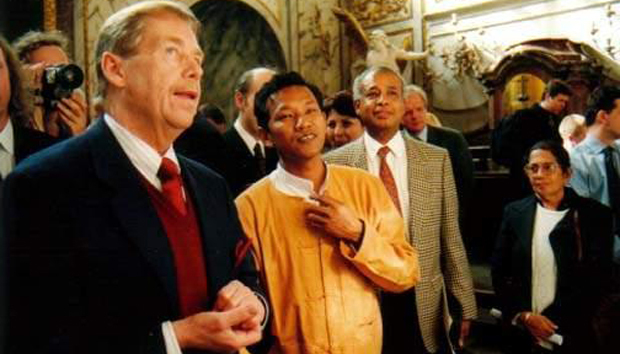 The Czech Republic, under Havel’s leadership, has been one of the most supportive and longest-lasting allies in our quest for democracy in Burma. The news of Havel’s passing has been met with great sorrow by those who continue to fight for freedom in Burma, for we have lost a true friend. There is no way to repay such lifelong support such as Havel offered. I am proud to have been one of Václav Havel’s guards of honor at his funeral. I can only hope that my presence was a reminder of the deepest respects the people of Burma have for this stalwart of human rights and democracy. He will be missed and we hope he rests in peace. Bo Kyi is joint-sectary of a Burmese human rights group, the Assistance Association for Political Prisoners-Burma (AAPP), based in Thailand.